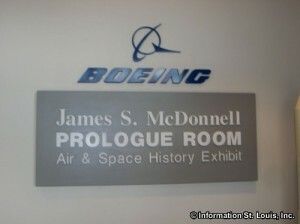 The James S. McDonnell Prologue Room is in the lobby of Building 100 which is located adjacent to Lambert-St. Louis International Airport and is part of Boeing's Integrated Defense Systems. Visitors can view the story of more than 80 years of aviation history, from the first bi-planes to manned space missions. There are large-scale models of Air Force One, the F-15 Eagle, the AH-64 Apache, the Space Shuttle and the International Space Station. There are also full scale models of the Harpoon radar-guided missile and engineer mock-ups of the the spacecrafts Mercury and Gemini. The James S. McDonnell Prologue Room is not open to the general public, but tours are available by reservation only to organized adult groups of 10 or more. Educational student tours are also available to fourth grade and above. All tours are free and are available Monday through Friday.